As Scandals Crest, Fox News Once More Under Siege Advertisers are beginning to pull their commercials from Fox News star Bill O'Reilly's flagship broadcast as allegations of sexual harassment continue to grow. Advertisers are beginning to pull their commercials from Fox News star Bill O'Reilly's flagship broadcast as allegations of sexual harassment continue to grow. Fox News Channel is once more under siege, facing several concurrent scandals and legal challenges scattered across different courtrooms, and casting a pall over the network's executive suites. Fresh and harsh scrutiny cast on star host Bill O'Reilly over allegations that he sexually harassed multiple women has given major corporations pause about associating themselves with the top-rated figure in cable news. In just the past 48 hours, at least 20 advertisers, including prominent automobile manufacturers, announced they would cancel upcoming ads on his prime-time program or avoid placing future commercials there. The ouster of chairman Roger Ailes last summer during a sexual harassment scandal was supposed to calm the waters. Yet two new lawsuits involving unrelated charges of sexual and racial discrimination raise serious questions about the decisions of Fox News Co-president Bill Shine and general counsel Dianne Brandi, among other executives. Each was a long-time Ailes lieutenant. Each survived his forced departure. Together, they've kept O'Reilly front and center on the network, despite all the payments that O'Reilly, Fox and parent company 21st Century Fox have made over the past dozen years to quell such accusations. The two executives helped to arrange payments made to privately settle past sexual harassment complaints against Roger Ailes. One former Fox News booker was paid $3 million back in 2011, five years before Gretchen Carlson's lawsuit against him exploded publicly. Shine and Brandi said they did not believe her story to be true at the time but later changed their minds as they learned of additional accusations against Ailes. Some of those past payments by Fox News to women are being investigated by federal prosecutors to see if they were structured to avoid disclosing them to investors in 21st Century Fox, as first disclosed by a lawyer to suspended Fox News host Andrea Tantaros, who is currently suing Ailes and the network. Brandi, the network's top lawyer, also stands accused of doing nothing after being informed in the fall of 2014 that Judith Slater, then the company's comptroller, had created a racist work environment in a lawsuit filed by three African-American employees of Fox News. A senior official at 21st Century Fox tells NPR it has spoken to O'Reilly and that the host has given assurances he believes in the company's commitment to offer a welcoming workplace for all staffers. Corporate executives did not respond to several requests for comment about the status of Shine and Brandi. Through his lawyer, Susan Estrich, Ailes denies all the allegations made against him, including the newest, this week, by paid Fox News contributor Julie Roginsky. Ailes blames an orchestrated campaign against him. O'Reilly says he's victimized by people who target him because he's successful and wealthy. He says he agreed to settlements to help his children avoid public scorn. Fox News typically denigrates those who file suit or criticize its stars and executives, but it is currently uncharacteristically subdued, in keeping with a promise made last summer that the culture of the network would change. Roginsky's lawsuit against Ailes argues that promise from the Murdoch family, which controls the company, has rung hollow. In her sexual harassment lawsuit, Roginsky alleges that Shine and Brandi retaliated against her for failing to come to Ailes' defense and for raising her complaints about Ailes' conduct internally. Fox News did fire Slater, the comptroller at the heart of the racial discrimination lawsuit, but as the lawyers for the plaintiffs note, only in late March, several days before the suit was filed. Fox News and Brandi have not responded to the specific question of whether she was told of Slater's behavior, in 2014 and 2015, and refused to take action, as alleged in the lawsuit by Monica Douglas, the head of credit and collection in Fox News' accounting department, and one of the plaintiffs in the new racial bias suit. Shine and Brandi's decisions have been challenged previously. Their continued presence raises the more fundamental question of the judgment of Rupert Murdoch, the family patriarch, who stepped in to oversee Fox News after Ailes was hustled out. O'Reilly's continued presence has undercut the Murdochs' contention of a shift in culture, according to several women who work at the network who spoke to NPR on condition of anonymity. Not everyone who has made allegations against O'Reilly or Ailes received or even sought money. Wendy Walsh, a California-based psychologist and former television news reporter and anchor, auditioned on the air for a paid slot with a recurring role — "a very big opportunity," in her words. Walsh told NPR that just three weeks in, she received a call from an O'Reilly producer saying he wanted to arrange a dinner during an upcoming trip in Los Angeles. Shortly after the outset of the meal at the restaurant Wolfgang Puck at Hotel Bel-Air, O'Reilly promised Walsh the job, she says. Walsh says she declined O'Reilly's entreaties to come up to his room — and that he turned nasty at the bar, telling her there would be no job. "It was a sad cocktail party story that women tell each other and shrug our shoulders and go, 'Ugh, another one,' " Walsh says. "I can't believe this is still going on." 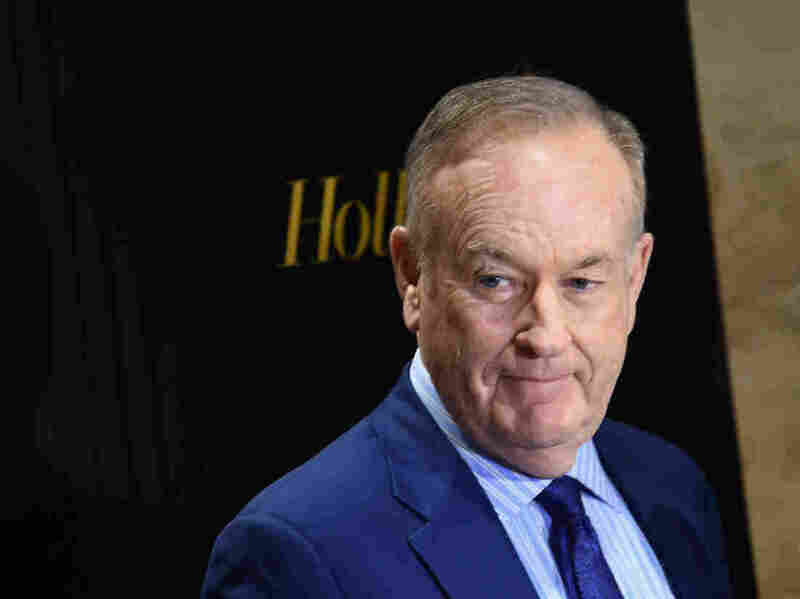 O'Reilly has not directly responded to the substance of Walsh's depiction of this episode but issued a more general statement saying no women had filed complaints through the network's human resources department. O'Reilly's show is the network's top revenue-generating program; and the network has proved highly lucrative for 21st Century Fox. But any financial hit from balky advertisers is likely to be limited as Fox News relies more on licensing fees from cable providers than from advertising spots. And most advertisers are placing their commercials on different Fox News programs, not withdrawing altogether. One which is: SHRM, a leading trade group for the human resources industry.